How Should I Mix and Match Natural Stone Shapes? What types of thin veneer are Harsh Climate Approved? The exterior of your home, government, or commercial building faces Mother Nature’s extreme conditions every day. Which Cement Board Saves Stone Install Time? See this FAQ on its own page (useful for sharing). In your showroom you have a fireplace (see below), with a lot more tan colors than the Boston blend in the other samples. Is this random based on when you get the stone, up to the mason to pick and choose stones, or something else? If you would like your Boston Blend to be either more tan or more gray, we suggest adding a control color. The control color could be Greenwich Gray or Colonial Tan, which would be mixed in to “push” the color to your desired design aesthetic. An alternative method is to order extra stone beyond the normal 15% waste and instruct your mason to favor tan or gray stones in the Boston Blend mix. Hi, I was in a few weeks ago looking at stone and had a few quick questions. In the displays of the Boston Blend Ashlar vs Ledge the Ashlar seems much “tighter”. Is this an illusion or just how these displays were put together? The “tighter” ashlar stone was in fact more carefully crafted for a dry-fit installation by our stonemason resulting in tighter joints. 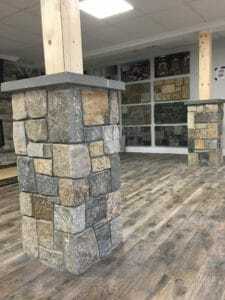 What we try to show in our showroom – beside the differences in stone types and colors – are the differences between installation techniques. Can Your Thin Veneer Be Used Outside? Stoneyard Thin Veneer is a natural product, not man-made from concrete. The stone is at least one million years old, has been through countless freezes and thaws so there will be no problem with expansion and contraction, and will not fade. Unlike man-made faux stone, it is the same color throughout. The stone is cut and crafted from either natural New England Fieldstone or stone cut from a quarry in the New England area of the U.S. 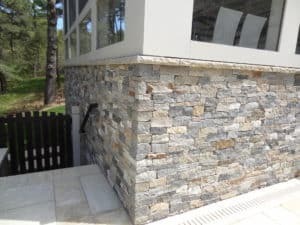 When installing thin veneer outdoors, it is essential to use proper installation methods such as cement board and a water barrier to prevent water from getting behind the stone. 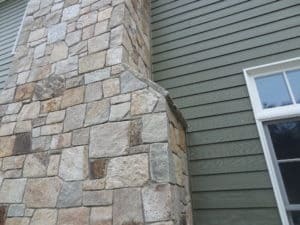 Why is Stoneyard New England Fieldstone a Green Building Material? 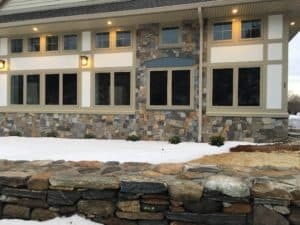 Stoneyard.com’s New England Fieldstone was created by Mother Nature, making it one of the greenest building products available. In addition, all of our stone comes from within a 75-mile radius of our Littleton, MA location, reducing the amount of shipping and thereby leaving a small carbon footprint. Gathering the stone does not damage the beautiful New England countryside; we only use stone that would have otherwise been plowed over by farmers expanding their plots. 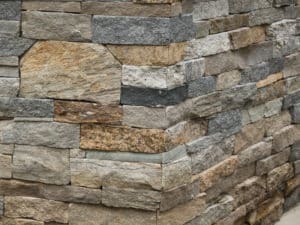 Choosing Stoneyard.com’s New England Fieldstone means you are purchasing an eco-friendly product that showcases the beauty of nature right at your own home. Products with pre-consumer recycled content – Pre-consumer (also called “post-industrial”) recycling refers to the use of industrial by-products, as distinguished from material that has been in consumer use. Iron-ore slag used to make mineral wool insulation, fly ash used to make concrete, and PVC scrap from pipe manufacture used to make shingles are examples of post-industrial recycled materials. Salvaged products – Products reused. Many salvaged materials used in buildings (bricks, millwork, framing lumber, plumbing fixtures, and period hardware) can be found in local regional salvage yards. Products with post-consumer recycled content – Recycled content is an important feature of many green products. From an environmental standpoint, post-consumer is preferable to pre-consumer recycled content, because post-consumer recycled materials are more likely to be diverted from landfills. Products that reduce material use – Products meeting this criteria may not be distinctly green on their own but because of resource efficiency benefits that they make possible are considered green. Products with exceptional durability or low maintenance requirements – These products are environmentally attractive because they need to be replaced less frequently, or their maintenance has very low impact. Sometimes, durability is a contributing factor to the green designation but may not be enough to distinguish the product as green on its own. This criterion is highly variable by product type. Included in this category are such products as fiber-cement siding, fiberglass windows, slate shingles, and vitrified-clay waste pipe. Certified wood products – Third-party forest certification, based on standards developed by the Forest Stewardship Council (FSC), is the best way to ensure that wood products come from well-managed forests. Wood products must go through a chain-of-custody certification process to carry an FSC stamp. Manufactured wood products can meet the FSC certification requirements with less than 100% certified wood content through percentage-based claims. A few manufactured wood products, including engineered lumber and particleboard or MDF, can be included if they have other environmental advantages-such as absence of formaldehyde binders. Rapidly renewable products – Rapidly renewable materials are distinguished from wood by the shorter harvest rotation- typically 10 years or less. They are biodegradable, often (but not always) low in VOC emissions, and generally produced from agricultural crops. Because sunlight is generally the primary energy input (via photosynthesis), these products may be less energy-intensive to produce-though transportation and processing energy use must be considered. Examples include linoleum, form-release agents made from plant oils, natural paints, geotextile fabrics from coir and jute, cork, and such textiles as organic cotton, wool, and sisal. Note that not all rapidly renewable materials are included -non-organic cotton, for example, is highly pesticide-intensive. In some cases, even though a product qualifies for by virtue of its natural raw materials, it may have negatives that render it inappropriate for certain uses-such as high VOC levels that cause problems for people with chemical sensitivities. Natural or minimally processed products – Products that are natural or minimally processed can be green because of low energy use and low risk of chemical releases during manufacture. These can include wood products, agricultural or nonagricultural plant products, and mineral products such as natural stone and slate shingles. Alternatives to ozone-depleting substances – Included are categories where the majority of products still contain or use HCFCs. Alternatives to hazardous products – Some materials provide a better alternative in an application dominated by products for which there are concerns about toxic constituents, intermediaries, or by-products. Fluorescent lamps with low mercury levels are included here, along with form release agents that won’t contaminate water or soils with toxicants. Also included here are alternatives to products made with chlorinated hydrocarbons such as polyvinyl chloride (PVC) and brominated fire retardants. Products that reduce or eliminate pesticide treatments – Periodic pesticide treatment around buildings can be a significant health and environmental hazard. The use of certain products can obviate the need for pesticide treatments, and such products are therefore considered green. 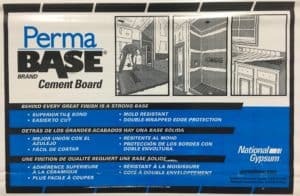 Examples include physical termite barriers, borate-treated building products, and bait systems that eliminate the need for broad-based pesticide application. Products that reduce storm water pollution – Porous paving products and green (vegetated) roofing systems result in less storm-water runoff and thereby reduce surface water pollution. Storm water treatment systems reduce pollutant levels in any water that is released. Products that reduce impacts from construction or demolition activities – Included here are various erosion-control products, foundation products that eliminate the need for excavation, and exterior stains that result in lower VOC emissions into the atmosphere. Fluorescent lamp and ballast recyclers and low-mercury fluorescent lamps reduce environmental impacts during demolition (as well as renovation). Products that reduce pollution or waste from operations – Alternative wastewater disposal systems reduce groundwater pollution by decomposing organic wastes or removing nutrients more effectively. Masonry fireplaces burn fuel-wood more completely with fewer emissions than conventional fireplaces and wood stoves. Recycling bins and compost systems enable occupants to reduce their solid waste generation. Building components that reduce heating and cooling loads – Examples include structural insulated panels (SIPs), insulated concrete forms (ICFs), autoclaved aerated concrete (AAC) blocks, and high-performance windows and glazings. In the case of windows, the base standard for energy performance of windows is an NFRC-rated unit U-factor. If the windows are made from an environmentally attractive material (e.g., high recycled content or superb durability), the energy standard can be less stringent. If the frame material is nongreen, such as PVC (vinyl), the energy standard should be more stringent. Equipment that conserves energy and manages loads – With energy-consuming equipment, such as water heaters andrefrigerators, dishwashers, and clothes washers,etc you can use standards set by Energy Star to judge the water or energysavings. Renewable energy and fuel cell equipment – Equipment and products that enable us to use renewable energy instead offossil fuels and conventional electricity are highly beneficial from an environmental standpoint. Examples include solarwater heaters, photovoltaic systems, and wind turbines. Fuel cells are also included here, even though fuel cells today nearly always use natural gas or another fossil fuel as the hydrogen source-they are considered green because emissions are lower than combustion-based equipment and because the use of fuel cells will help us eventually move beyond fossil fuel dependence. Fixtures and equipment that conserve water – All toilets and most showerheads today meet the federal water efficiency standards, some are more efficient than others but not all of these products perform the same. Products that do not release significant pollutants into the building – Included here are zero- and low-VOC paints, caulks, and adhesives, as well as products with very low emissions, such as nonformaldehyde manufactured wood products. Products that block the introduction, development, or spread of indoor contaminants – Certain materials and products are green because they prevent the generation or introduction of pollutants-especially biological contaminants-into occupied space. Products that remove indoor pollutants – Certain ventilation products, filters, radon mitigation equipment, and other equipment and devices that help to remove pollutants or introduce fresh air. Because ventilation equipment is now fairly standard, only products that are particularly efficient or quiet, or that have other environmental benefits are considered green. Products that warn occupants of health hazards in the building – Included here are carbon monoxide (CO) detectors, lead paint test kits, and other IAQ test kits. Products that improve light quality – There is a growing body of evidence that natural daylight is beneficial to our health and productivity. Products that enable us to bring daylight into a building, including tubular skylights, specialized commercial skylights, and fiber-optic daylighting systems, are all green by nature. Products that help control noise – Noise, both from indoor and outside sources, adds to stress and discomfort. A wide range of products are available to help absorb noise, prevent it from spreading, masking it, and even reducing it with sound-cancellation technologies. Products that enhance community well-being – Looking beyond the walls of a building, many products can contribute to safer neighborhoods, increasing walkability and making high-density communities appealing. Does the Thin Veneer need to be installed with a masonry shelf? No masonry shelf is needed. Stoneyard™ Thin Veneer can be installed directly on cement board or brick. Can you install dry-laid on exterior applications? Yes with LATICRETE MVIS Premium Veneer Mortar. What kind of blade/tool do I need to cut your stone? A diamond blade on a right angle grinder or wet saw. We recommend installation by a Certified Thin Veneer Installer. How do I cut Thin Veneer when trimming is necessary? How many square feet do thin veneer corners cover? For each linear foot of corners installed you will get approximately 0.75 SF of coverage. Do I need corner pieces when installing thin veneer? If you are covering a corner with stone then…yes. 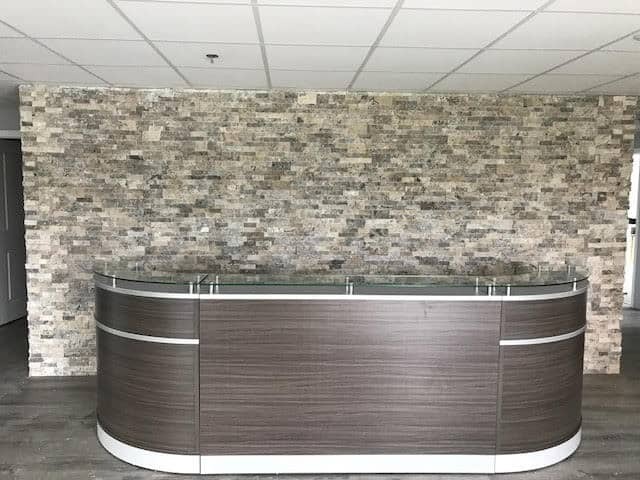 Our natural stone thin veneer corners give your project the appearance of full thickness stone. 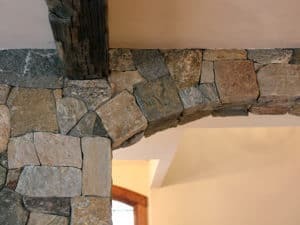 How do I bond thin veneer stone to metal, such as a metal fireplace surround? 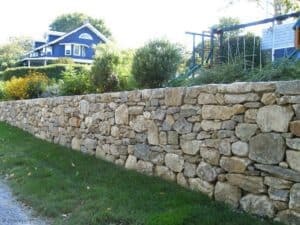 How do I install a dry laid fieldstone retaining wall? Use our on-line product calculators to determine coverage or send us project details and plans using our contact form. How do I install Thin Veneer? 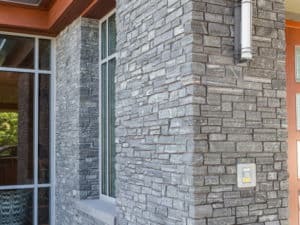 Please read Installing Thin Stone Veneer for more information. 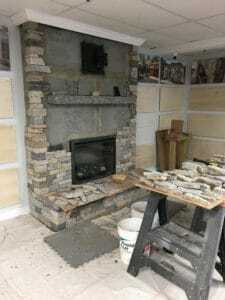 How much does Stoneyard™ natural stone Building Veneer weigh? Building Veneer is 4 times heavier than Thin Veneer weighing in at 60 lbs/sf. 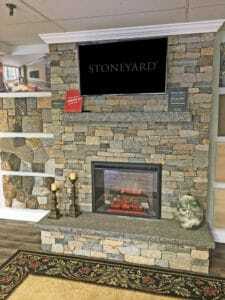 How much does Stoneyard™ natural stone Thin Veneer weigh? 14 lbs/sf or less (average of 13 lbs). How does Stoneyard™ Thin Veneer differ from Stoneyard™ Building Veneer? Can you blend or mix different colors or shapes of Stoneyard™ Thin Veneer? Yes by purchasing in increments of 5 sf or 168 sf. If you are ordering crates of Boston Blend™ Thin Veneer, for example, you can order an additional crate (168 sf) of Greenwich Grey or Colonial Tan to add more grey or tan to the mix to achieve the desired color blend. How is Stoneyard™ Thin Veneer packaged? Flats are packaged in 168 square foot crates or 5 square foot boxes. Corners are packaged in 150 linear foot crates, 75 linear foot crates, or 5 linear foot boxes.